1. From my best friend, cheering me up about a bad breakup, buoying my self esteem. And giving me advice, mostly about boys, all of it very wise. 2. From my brother, telling me about his music, his art projects, his wonderful wife-to-be (now his wife) and their two cute puppies. Always a hint of humor in his missives, sometimes the kind that smacked me upside the head, sometimes just a little twist of phrase that was meant to make me smile. 3. From my parents. My mom simple and direct: What are you up to? When will we see you next? My dad brief and kind: Great story, proud of you for that magazine cover piece, nice seeing you last weekend. You are, of course, the greatest! Only my Dad would find a way to reference Leonard Cohen in a birthday email. I started to tear up a bit at that one, because honestly I never believed that I was very great at all, until after I turned 30 – really 31 – and I finally got emotionally mature enough to start behaving like an adult. I might have done some good things as a professional before then, but getting my attitude together and acting like a credible human took me longer than it should have. I’ve been a better friend and a better person in only the last two years of my life. If I’d followed my dad’s example, I would have gotten to the same place, but maybe sooner. Will and I are spoiled in both our parents, and we know it. For Father’s Day, I thought I’d share a few life lessons we have learned from our Dad. If you don’t have anything nice to say, you should probably be keeping your mouth shut. Taking care of your family is always priority number one. Then work, and contributing to your community. Selfish personal projects are way further on down the list. Read a lot of books. Remember as much of them as you can. It’s nice to be able to reference a historic anecdote or funny quote in conversation, and people appreciate it. Music matters. Make it part of your life every day. When all else fails, drive around on the tractor for awhile. You’ll feel better, and if not, at least there will be a nice fire break around the house. Dad, we love you dearly. Happy Father’s Day, and happy early birthday. Thanks for doing so much for us. 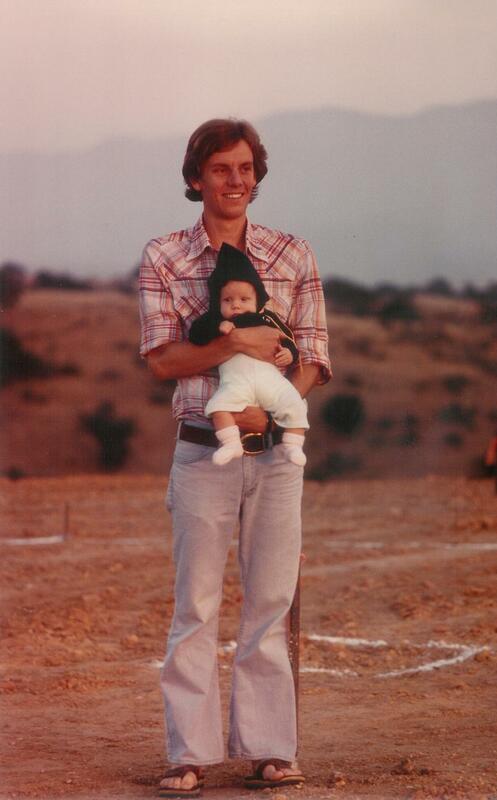 Dad and I at Calzada Ridge, before the house. 1979.